Hughes Network Systems, LLC (HUGHES), an EchoStar company, has announced today that the company's HughesON™ Managed SD-WAN solution has won the 2018 SD-WAN Product of the Year Award presented by INTERNET TELEPHONY magazine. Hughes was recognized for its innovation, vision and execution in delivering superior SD-WAN solutions to distributed enterprises by combining innovative broadband optimization technologies and best-in-class security with integrated network management. 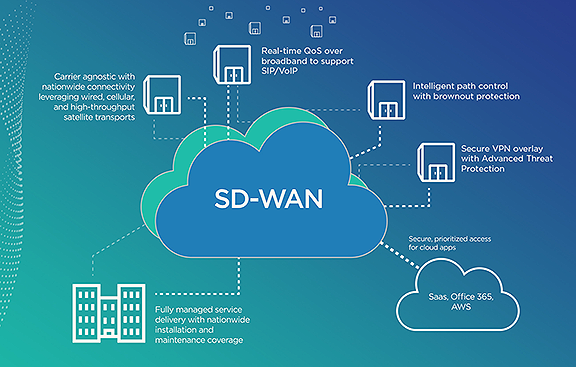 According to the company, they lead the market in managed SD-WAN solutions, with more than 28,000 sites in service and the largest single customer deployment with more than 3,500 locations. The award-winning HughesON Managed SD-WAN solution delivers superior application performance and enhanced network security through proprietary Hughes ActiveTechnologies™ and industry-leading security. Hughes ActiveTechnologies, a suite of network optimization capabilities, enables dynamic Quality of Service (QoS) over broadband networks mitigating network blackouts and brownouts using traffic shaping, intelligent path selection and Forward Error Correction (FEC). Providing peace of mind to customers with dispersed locations, HughesON Managed SD-WAN also integrates Next-Generation Firewall (NGFW) and Unified Threat Management (UTM) capabilities from Fortinet. Advanced security services include managed content filtering, intrusion protection, data leak prevention and more. SD-WAN Product of the Year Award winners were determined by product reviews conducted by TMC Labs, an in-house testing facility for TMCnet, parent company of INTERNET TELEPHONY magazine. TMC previously has honored Hughes for the company’s broadband QoS and Internet telephony products. Mike Tippets, VP of marketing, Hughes, said the company is honored that the HughesON Managed SD-WAN solution has been selected as product of the year. This win validates what the firm's customers already know: the Hughes SD-WAN solution delivers optimized bandwidth across their sites plus the integrated security they need to operate in today’s cloud-based, app-driven environment.